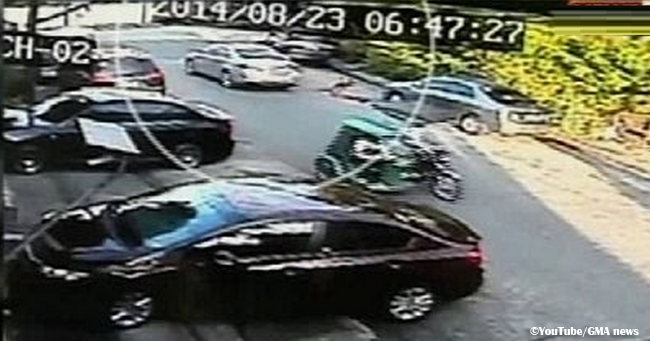 A CCTV video was taken near the corner of Maria Clara streets and Sgt. Bumatay in Mandaluyong last Saturday, August 23, 2014. Based on the statement of the victim, she was abducted by a foreigner around 6 a.m. The suspect, who was driving the Toyota Camry, asked her for directions to a remittance center while she was waiting for a ride at Martinez Street, when she was forcefully pulled inside the car and later, sexually abused. She tried to fight until her dress were stripped off and soon got a chance to escape by jumping off the car naked. According to GMA news, the authorities are now investigating a certain name and plate number of a car related to the incident.